Morphe Brushes 700 8 Piece Candy Apple Red Brush Set £13.50 I've never been a top-your-makeup-up-midday kinda girl. Having worked in a Zoo for 2 years previous to my new job in London, it didn't matter if my complexion wasn't selfie ready. But as unexpected meetings, post work drinks and lunches are now a common occurrence, midday makeup application is now a necessary evil. So naturally a selection of basic brushes for my handbag is essential. And the Morphe Brushes Candy Apple Brush Set is a collection of 8 brushes with natural and synthetic fibres (they're super soft), housed in a bright red roll and cost a mere £13.50. The cute kit includes; Tapered Powder Brush, Tapered Blush Brush, Flat Foundation Brush, Oval Fluff Brush, Chisel Fluff Brush, Pointed Crease Brush, Angle Liner Brush - all the tools I need for a quick fix! 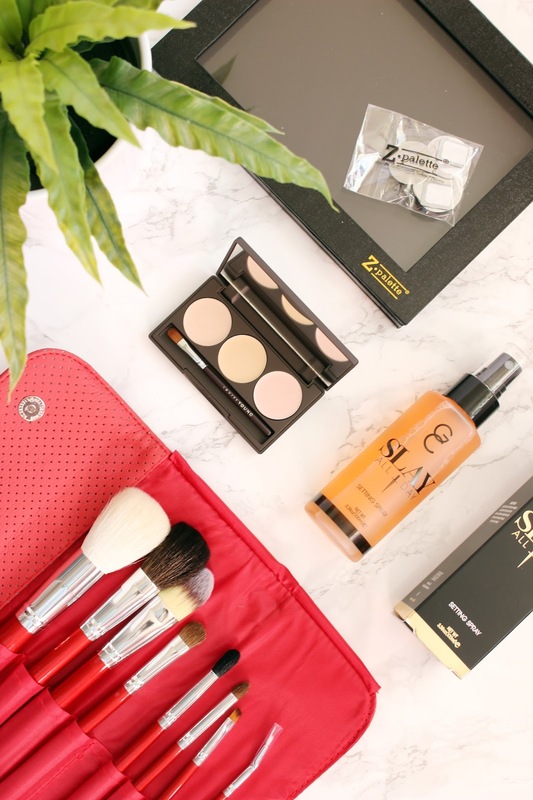 Gerard Cosmetics Slay All Day Setting Spray in Peach £10.15 RRP £14.50 I reach for setting sprays over primers daily as they're convenient and by far my favourite way to ensure my makeup will last for as long as possible. And it was about time I put the Insta famous setting spray from Gerard Cosmetics through its paces. Available in 5 different colours/scents the GC Slay All Day Setting Spray promises to keep your makeup from sliding down your face and reduce any oil buildup after a long day spent outdoors. And whilst I'm yet to truly put it to the test, on first spritz the setting spray is sweet and heavily scented (reminds me a little of Topps Mega Mouth Candy Sprays) and has a serious cooling effect. Louise Young Concealer Trio in Light £14.00 RRP £20.00 Whilst my beauty base and concealer collection is bursting at the seams (see here for reference). I lack a concealer for disguising blemishes. Spot concealer hasn't always been an essential in my makeup regime, but as mentioned previously, rather than starting from scratch and reapplying my makeup midday, spot concealing is a handy and quick. And the Louise Young Concealer Trio features three shades of concealer, a light formulation specially designed for the under eye area and to deeper shades to blur the appearance of any complexion imperfections. The palette itself is slim and fits perfectly in my everyday makeup bag. Can you resist the temptations of Beauty Bay?